Women’s voices need to be heard in discussions regarding foreign and defence policy. 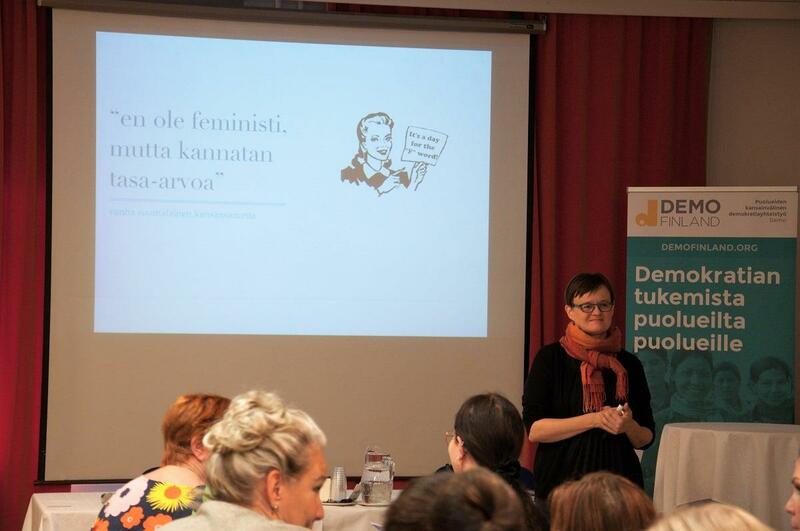 This is why Demo Finland and the Ministry for Foreign Affairs of Finland organized the Democracy Academy -training course for the representatives of parliamentary parties’ women’s organizations. In early November, 22 representatives from different women’s organizations gathered together to discuss and learn about development policy and foreign and defence policy. The aim of Democracy Academy was to deepen the participants’ understanding on the interlinkages between development policy and foreign and defence policy and through this, strengthen the voice and role of female politicians in political discussions and decision-making. In addition, Democracy Academy emphasized the connections between democracy and development and defence policy as well as the importance of democracy support in the current global situation. Strengthening the voice and role of female politicians in discussions regarding foreign and defence policy is important, as the number of women in leading positions in foreign and defence policy is very low. According to the latest statistics by Inter-Parliamentary Union (IPU), ministerial portfolios are very much divided between genders. For instance, in 2017 there were 102 female Ministers of Social Affairs worldwide. Simultaneously, there were only 15 female Ministers of Defence. The situation does not look any better in Finland, a country regarded a pioneer in gender equality. During the past 100 years Finland has had only one female Minister of Foreign Affairs and two female Ministers of Defence. Democracy Academy included panel discussions and speeches from experts who work in various fields. 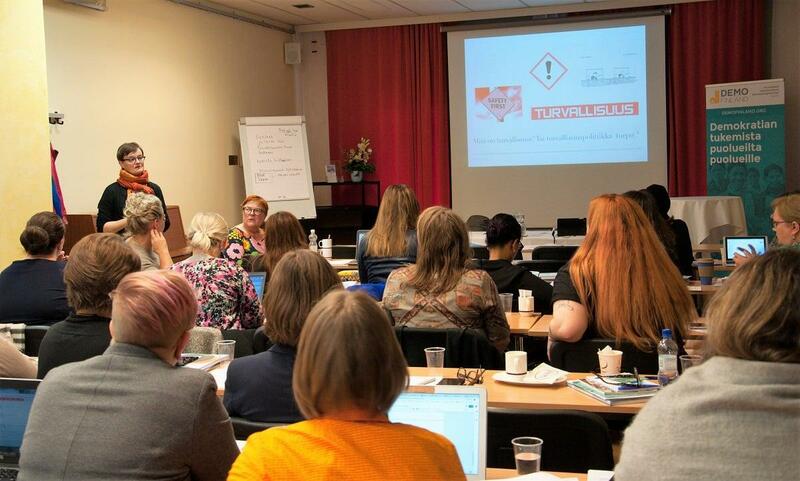 The topics ranged from the experiences of Finnish female politicians who work in foreign and defence policy to current defence and security issues both nationally and globally. The programme included various speakers from the Ministry for Foreign Affairs, such as Rauno Merisaari, the Ambassador for Human Rights and Democracy. The Ambassador presented interesting viewpoints on democracy support as a part of Finnish Foreign and Development policy. Moreover, Ilkka Salmi, the Permanent Secretary of the Ministry of the Interior provided details about the national security challenges in Finland. 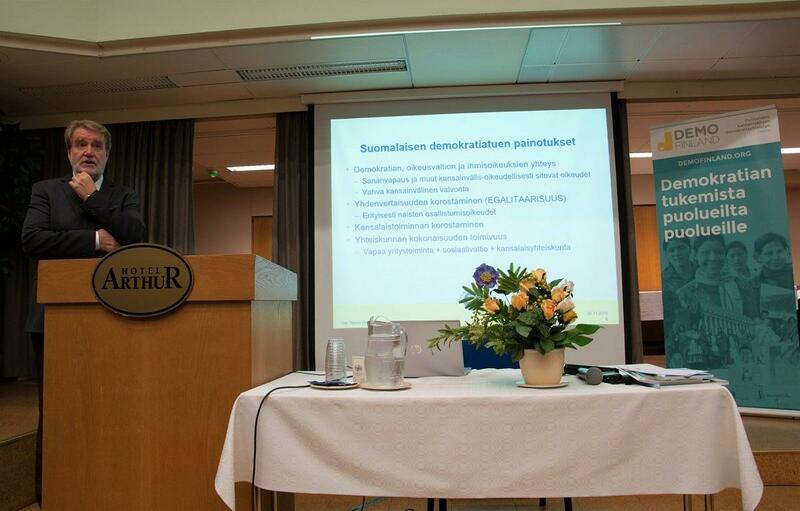 Docent Marjaana Jauhola offered an academic viewpoint on gender equality in defence policy. Jauhola is widely known as an active spokesperson for feminist foreign policy and in her research, she has critiqued the United Nations Security Council Resolution 1325 on “Women, peace, and security”. Jauhola started her session by describing her own experiences and how the gendered nature of defence policy has affected her work as a researcher. 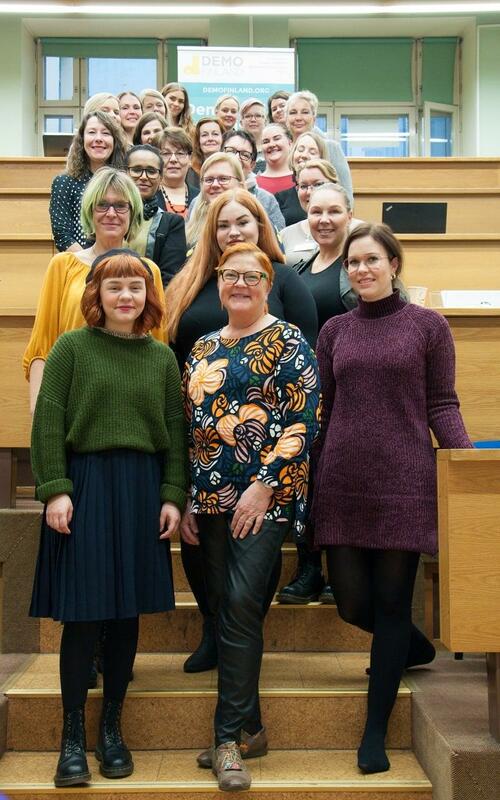 Because the field of defence studies is quite masculine in Finland, it has not been easy to research defence policy from a feminist perspective. “It is difficult to combine feminism and defence politics also because feminism is seen as a threat in itself. However, it is important to point out that there have always been people who see feminism as a security threat. The threat of feminism has been present throughout history and in various contexts”, Jauhola explained. Through her own research Jauhola has noticed how the use of gender sensitive rhetoric and for instance, the term “gender”, can pose a threat in some contexts. Mainstreaming of the term “gender” has challenged traditional thinking where women’s rights are detached from wider discussions. During her speech Jauhola emphasized the importance of a feminist approach in discussions about foreign and defence policy. Jauhola also pointed out that securing women’s rights and participation requires real and extensive investments because equality does not just happen by itself. At the end of her speech Jauhola encouraged all the participants to analyse whose agenda Finland’s foreign and defence policy is pursuing. We should also focus on gendered divisions in ministerial portfolios and the way how certain political sectors are labelled as feminine or masculine. Challenging the current order is the first step towards gender equality. Read what Demo does to support women’s participation here!